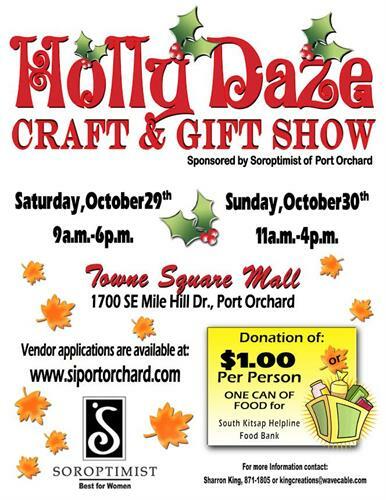 Soroptimist International of Port Orchard invites you to their annual Holly Daze Craft and Gift Show, located at South Kitsap Towne Square Mall in Port Orchard. 1700 Mile Hill Drive, Port Orchard. Stroll down Holly Daze Lane and visit our 60+ vendors who produce beautifully handcrafted jewelry, pottery, specialty candles, knitted creations, yard art, holiday gifts, glass art, wood art and much more. Vendor applications are available at www.siportorchard.com. For more information, contact Sharron King.